CRAZY COOL GROOVY!!! : 2016 TIME 100!!! What TIME is it, do YOU ask?!?!? 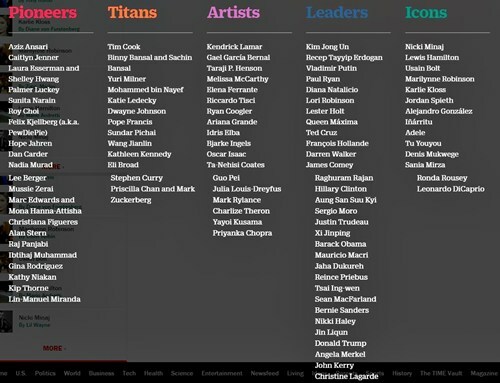 It is time for TIME Magazine to publish their annual ode to worldwide power, influence, and recognition by posting the TOP 100 PIONEERS, TITANS, ARTISTS, LEADERS, and ICONS on the entire PLANET EARTH. CHRISTINE LAGARDE, NICKI MINAJ, PRIYANKA CHOPRA, LEONARDO DiCAPRIO, LIN-MANUEL MIRANDA, and MARK ZUCKERBERG and wife PRICILLA CHAN grab the six covers. Meet the 2016 TIME 100 MOST INFLUENTIAL PEOPLE In The ENTIRE WORLD.